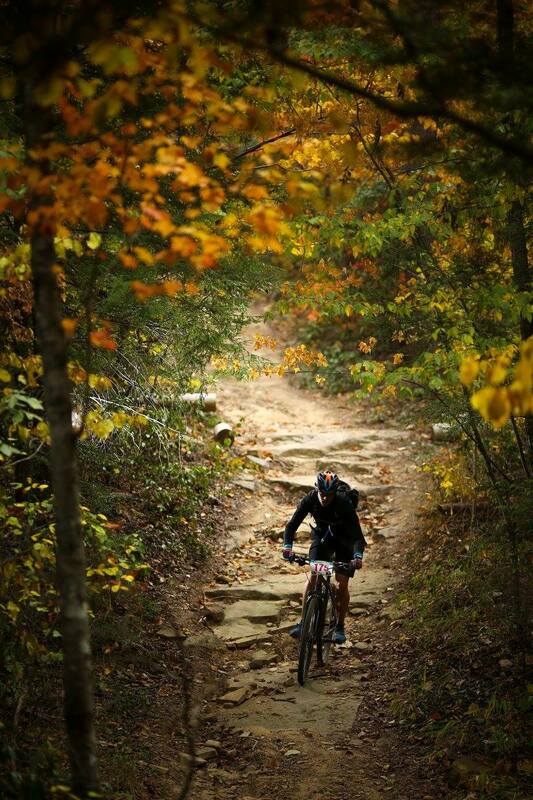 The Lula Lake Land Trust 5 Points 50/25 is Chattanooga’s Ultimate Endurance Mountain bike race. 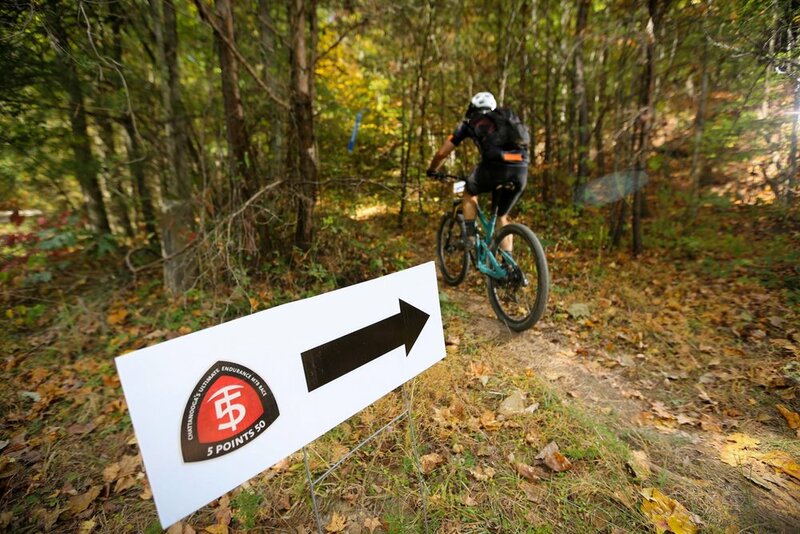 Racers will enjoy a grueling course packed with single track, climbs, downhills, rock gardens, and smooth flowy trails through the 5 Points Trail system, Lula Lake Land Trust, the Cloudland Connector Trail (including the 6.5 mile Long Branch/Nickajack section) and private property. Post race activities include camping, music, vendors, food and more. The 25 mile option gives racers a taste of the endurance mountain bike experience. Some of the same great trails as the 50 and still an admirable challenge with 2700 ft. of elevation gain. Late registration open through Oct. 10, no guaranteed t-shirt and $10 price increase. There will be day of registration this year! $20 price increase and no t-shirt. Since a portion of the race course is on private property, there is no map or turn by turn available. The elevation is for the 50 mile is below and is approximately 4700 ft. of elevation gain. The 25 covers some of these same private trails and has an elevation gain of approximately 2700 ft. Starting from the main gate of the Lula Lake Land Trust , the race begins on pavement to thin the pack before hitting Five Points ; it then combines most of the trails in the Five Points system with multiple segments of the Cloudland Canyon Connector Trail (CCCT). By the time racers find themselves approaching the Nickajack Road Trailhead, they’re 35 miles into the race, have ridden about 25 miles of prime singletrack…and then the fun really starts. Those final 15 miles of the race combine several miles of trail on private property, linking the CCCT and Five Points to the trails at Lula Lake. It is through the grace of these private landowners, including the Long Branch Homeowners Association, that the race is possible (course description RootsRated). Race start time: 50 Mile starts at 9:00 a.m., the 25 mile at 9:15 a.m. at the entrance to the Lula Lake Land Trust. Check-in waiver and Packet Pickup: There is a mandatory check-in at the Lula Lake Land Trust on Friday from 5 p.m. - 8 p.m. or on Saturday from 6 a.m. -8:30 a.m.
Print off this waiver, sign it, AND give it to a friend to deliver to us during check in. Make sure you send your drop bags, as there is no way to deliver them to the Aid Stations on race day. Your friend MUST pick up your race packet with your race number in it and get it to you before the race starts! If you do not have someone deliver the waiver and/or fail to get your number from your friend, you will not be able to race. Pre-race meeting: The pre-race meeting will be held at the start line at 8:45 for the 50 Mile race and 9:05 for the 25 Mile race. Drop bags and pickup: The 50 Mile course includes 4 aid stations, the 25 Mile course includes 2 aid stations. Our Aid Stations are well stocked with hand off water bottles, fresh water and snacks, and be sure to carry with you the hydration and nutrition you require according to your training and health needs. Bags must be dropped by 8 a.m. on Saturday morning. Each racer is allowed two (2) one gallon drop bags that we'll provide. Drop bags can be picked up after the race next to the tent. Free primitive camping (toilets on site) will be provided at Lula Lake Land Trust on a first-come first-serve basis, and space is limited. This is where the race starts and finishes. When you arrive on Friday you must check with staff at the Land Trust at check-in so they can guide you to the areas that are designated for camping. Tents and Camping vans are okay but anything larger will not fit these areas. So if you have a travel trailer or large RV, you need to check with area campgrounds around Chattanooga. Due to the dry weather recently the Land Trust has advised no fires while camping. For lodging information, please click here.